I have two really delicious red lentil soups that I like to make and I couldn't decide which one to have, so I made them both. The one pictured above has carrots, tomatoes, and spinach added and you can see all the lovely colors. The other red lentil soup is pureed, so you can just see the orange color of the soup. 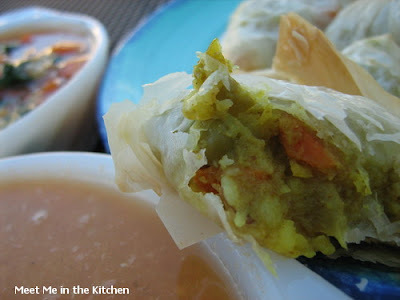 The pureed soup usually has a spiced oil that you drizzle on top, but since I made both the soups and a yummy phyllo side, I decided to skip the spiced oil. It does add an extra zip that is so delicious. 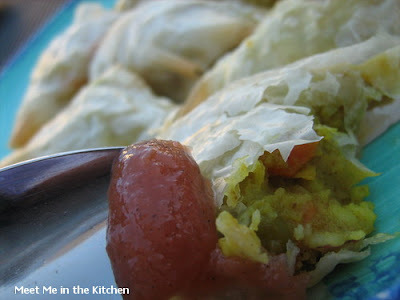 The Bundles of Joy were in a recent issue of Rachael Ray's magazine and reminded me of a samosa. 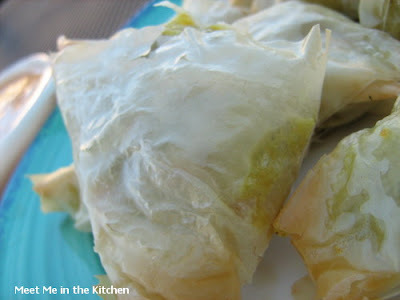 I love phyllo and whenever I work with it, I use cooking spray to moisten the sheets, rather than melted butter. I was making the little appetizers when I realized that I could save time and energy and just make one, long strudel. 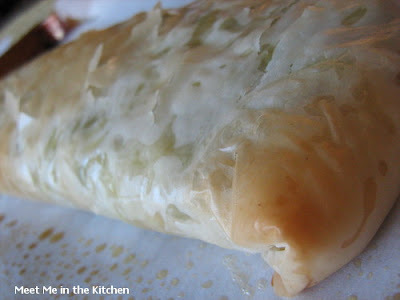 So, I layered 5 sheet of phyllo and put the filling down the middle and enclosed it. That was after I had already done 2 rounds of the little ones. It suggested serving them with apple butter, but we had so many pears and had decided earlier to make pear butter. Now that smelled amazing and tasted so good, that we went ahead and made another batch. It was a great combination. And yes, my daughter could not keep her finger out of the pear butter! This was a great dinner that we enjoyed outside- I am not sure how many more of those we will get, since the cold is coming. Yummy! If you are wondering about the Weekly Lunchbox, it will be posted tomorrow- I was just too excited about this dinner! To make the soup: In a large bowl wash the lentils in several changes of cold water until the water runs clear and drain them in a fine sieve. In a large heavy saucepan, cook the onions in the oil over medium heat, stirring, until they are softened. Add the garlic and gingerroot, and cook, stirring for 1 minute. Add the cumin and the ground coriander seeds and cook for 1 minute, stirring all the while. Add the lentils, broth, 1 1/2 cups water, and the tomatoes, and simmer, covered for 15-20 minutes, or until the lentils are tender. In a blender puree the mixture in batches, transferring to a bowl, until it is all pureed and return to the clean soup pan. Season with salt and pepper. To make the spiced oil: In a small skillet or saucepan, heat the oil over moderately high heat until it is hot but not smoking. Add the red pepper flakes, cuminseed, and turmeric, and fry the spices, stirring, for 10 to 15 seconds, or until the sizzling begins to subside. Remove from the heat. Drizzle the spiced oil with a spoon over the soup to serve. In 4-quart saucepan, heat oil on medium until hot. Add carrots and onion, and cook 6 to 8 minutes or until lightly browned and tender. Stir in cumin; cook 1 minute. Add tomatoes, broth, lentils, 2 cups water, salt, and pepper; cover and heat to boiling on high. Reduce heat to low and simmer, covered, 8 to 10 minutes or until lentils are tender. Stir in spinach. Makes about 7 1/2 cups. 1. Bring a medium saucepan of salted water to a boil. Add the potatoes, lower the heat and simmer until tender, about 15 minutes. Drain and mash. 2. Meanwhile, in a heavy skillet, toast the cumin and turmeric over medium heat, stirring occasionally, until fragrant, about 2 minutes. Add the oil, onion, garlic and salt and cook, stirring, until the onion is softened, about 7 minutes. Stir in the peas and carrots. Remove from the heat and stir in the mashed potatoes. 3. Position a rack in the center of the oven and preheat to 400°. Line a baking sheet with parchment paper. Brush 1 phyllo sheet with melted butter. Top with another phyllo sheet; brush lightly with butter. Cut lengthwise into five 2 1/2-inch-wide strips. Place 1 heaping tablespoon of the vegetable mixture at the end of each strip. Working with 1 strip at a time, fold the corner over the filling to enclose, forming a triangle; continue folding the strip like a flag, keeping the triangle shape. Place the resulting bundles seam side down on the baking sheet. Repeat with the remaining phyllo sheets and filling. Bake until golden, about 10 minutes. 4. 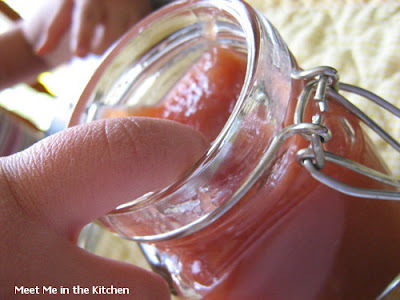 In a small bowl, stir the apple butter with 3/4 cup water. Serve warm or at room temperature with the bundles. Place pears in a blender or food processor; process until smooth. Combine pear puree, sugar, and remaining ingredients in a medium sauté pan over medium heat; bring to a simmer, stirring occasionally. Cook 3 hours or until mixture is thick. 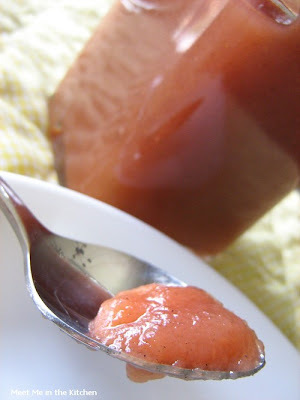 I have never made pear butter, but I really want to! It looks so good! 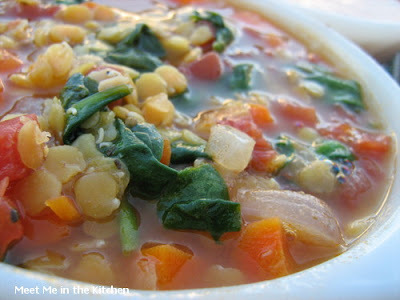 And the lentil soup sounds amazing too! How do you keep coming up with these fabulous recipes?? I love them all! Wow Mary Ann, this post is jam packed with goodness! I love each and every recipe here! Great post. This all sounds too wonderful for words, Mary Ann, and your pictures nearly sent me over the edge! The red lentil soups sound so utterly perfect for this time of year. And I just bought a huge and expensive thing of cardamom for the TWD Dimply Plum Cake and have been looking for ways to recoup my investment -- the ginger pear butter looks like it will be the perfect use for some of that gold dust sitting in my spice rack! Whenever I go to my favorite Turkish restaurant, Pita Palace here in New York, I order red lentil soup. Perhaps, I should try my hand at it. Like someone said, Fall is perfect and look at all my choices. GREAT post! Mary Ann - I would be excited about this dinner too! It all looks delicious and so gourmet! I love red lentil soup...I made it for the first time last year and it was so good, it's more like the pureed one. That pear butter would be so good in those oatmeal bars...I really like how those bundles look! 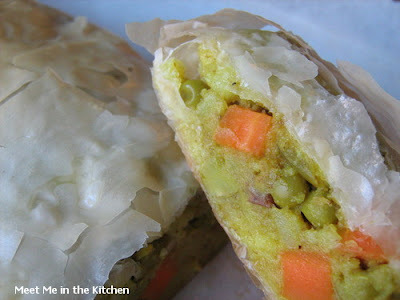 I am afraid of working with phyllo but I may have to get over that! WOW! How I love when Fall comes around. All those color and textures make me go crazy! I was in whole foods this morning and bought some lentils. Next to the ones I got were these lovely red ones and I thought they would be so much fun to use in a dish. I should have grabbed them as well as the soup looks delicious. 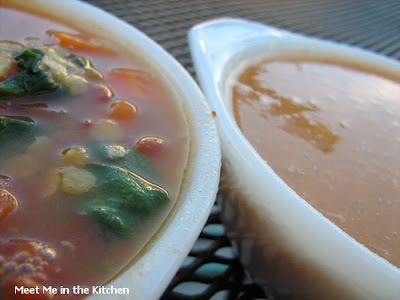 My family absolutely loves red lentil soup and here you give me two new ones to try. Thank youuuuu! And the pear butter look scrumptious, it would be great with that oatmeal bread ;-). Pear butter sounds delicious! And lentil soup--YUM!